Cordy Glenn (Georgia) was the clear offensive lineman winner today. He showed the ability to play outside at tackle as well as at guard today, and he was effective against every player except for Quinton Coples who was able to beat him on a couple of 1 on 1’s. He’s agile for his size and in talking to scouts they didn’t think his occasional waist-bending was a serious issue. He has the potential to play at four offensive lineman positions. He is strong enough and has a good enough anchor that he can recover if he’s initially pushed back, which enabled him to slow down Courtney Upshaw and Melvin Ingram today. Glenn’s ability to slow Upshaw and Ingram down today definitely set him apart from Zebrie Sanders (Florida State), Matt McCants (UAB) and James Brown (Troy) today. All three struggled mightily with bull-rushes today and were consistently pushed back and beaten thanks to their lack of lower body strength and ability to anchor. I like Zebrie Sanders’ potential, but his lower body strength is a serious issue right now. I think he has a shot at the 1st round still because of his upside, but he hasn’t been good the last couple of days. Ben Jones (Georgia) and William Vlachos (Alabama) have had a down week so far in my opinion. Jones is a mid-round center prospect in my opinion who has struggled with bull-rushes and speed at times this week. He’s not a center that can handle defenders one on one in the run game or pass protection for the most part. Vlachos is a very physically limited offensive lineman who has a late round or free agent grade in my opinion. He might stick on a roster because of his football IQ, but his short arms and limited size will hurt him. Jeff Allen (Illinois) continued a strong week today, this time inside at guard. That versatility will help him as he was consistently good at both tackle and offensive guard this week. Good, not great, but he’s definitely draftable in the 3rd or 4th round range. Quinton Coples (North Carolina) continues to show his fantastic upside. He isn’t a top 10 or possibly a top 15 pick, but he’s definitely got a 1st round grade from me. His upside is incredibly intriguing, but I don’t think he can consistently be a pass rushing force from the RE position, though I do think he could be a fantastic left defensive end. He can be as good as he wants to be, so interviews will be extremely important for him. I saw someone mention it on Twitter, but he seems like a possible candidate for a guy who breaks out in his contract year, earns a huge deal, and never lives up to the deal. He’s got red flags for sure, but his potential is extremely intriguing. Courtney Upshaw (Alabama) and Melvin Ingrim (South Carolina) continued to impress me. I think they are both versatile enough to play in a 3-4 at OLB or in a 4-3 at left defensive end. They both struggled a bit against Cordy Glenn, but he may be a top 50 prospect in my opinion, so I understand that to an extent. Kheeston Randall (Texas) continued to struggle today. He showed some of his agility and his athleticism but he struggled to disengage once blocked and too often was effectively blocked by William Vlachos, someone I don’t think is going to be a very effective center in the NFL because of significant physical limitations. However, I like what I have seen from Brandon Thompson (Clemson) and Jaye Howard (Florida). I’ve liked Howard for some time, but Thompson has definitely made it clear that he has quality starter upside as a 3-tech which is what I saw from the tape I’ve watched of him. Check out NFL Draft Monsters for the rest of our Senior Bowl Coverage! Ladarius Green (Louisiana Lafayette) is my favorite tight end on this roster. He’s my #2 TE in Mobile behind only Michael Egnew, but Green may have just as much upside as any tight end in the draft. His combination of pure size and athleticism is extremely intriguing and like Egnew he has good hands. He needs work as a blocker, but if the effort and work ethic is there that can be coached. But he will be a helluva match-up problem as a receiver who can be split out in the NFL, and those joker tight ends are all the rage right now. He looks like a 2nd or 3rd round prospect to me. Deangelo Peterson (LSU) is another player I’ve liked all year. He’s a sleeper because he never got much of a chance to show what he can do as a receiver at LSU, so he could surprise people once he gets to the next level. He’s got pretty good hands, size and athleticism and should end up in the 4th round or maybe a little higher on draft day. Brad Smelley (Alabama) has had a solid couple of days. He’s not an early-round guy by any means, but he’s draftable and has the work ethic to be a contributor on special teams and work his way up the tight end depth chart despite his lack of great size and athleticism. Zebrie Sanders (Florida State) impressed me today to a point. He’s an impressive athlete with a good first step, he can get out of his stance quickly and block down on defensive tackles which I liked. He really needs to get stronger in the lower body though and his hand placement was an issue today. He was letting his hands get too far outside which will draw holding calls and limit his ability to control the defender after he’s engaged him. He’s struggled to “finish” blocks as well. Multiple times in 1 on 1’s he had won the battle right up until the end when Coples or Ingram would finish and he didn’t. Sustaining that block and playing to the whistle isn’t always something you can coach. He’s got the athleticism and the length to play left tackle though, he just needs some coaching and weight training. I still have a late 1st round grade on him, but he’s obviously not perfect. Jeff Allen (Illinois) continues to impress. I’ll credit Wes Bunting (@WesBunting follow him) for showing me the light on him so to speak, but whenever I watched him I thought he looked like a solid tackle. He’s one of those players that the more I’ve watched him the more I like him. He’s definitely a sleeper at left tackle right now and while he struggled with Coples a couple times today, so did everyone. Allen held his own all day though and impressed scouts without a doubt. He’s got left tackle ability and will definitely go higher than people think. He could go in the 2nd round when all is said and done. Ben Jones (Georgia) did not impress me today. He was consistently beat off the snap by quicker players like Brandon Thompson and struggled to anchor against stronger players. He’s an average athlete that is a mid-late round player in my opinion, definitely not a 2nd or 3rd round Center. His stock is on its way down in my opinion. William Vlachos (Alabama) also looked bad today. His arms just look remarkably short (he measured in with 30 inch arms, which is not good for an offensive lineman) and he struggled to anchor today as well. He looks like a late round player to me. Matt McCants (UAB) had a bad day as well outside at tackle. He was victimized multiple times by Coples and Ingram as well as Courtney Upshaw. He has little strength in his lower body and it showed today. But he doesn’t look like an impressive athlete and just flat got beat off the edge a couple of times today. He’s not earning a high grade from me either, though I still need to study him. Will Blackwell (LSU) didn’t look very good to me today either, though he was solid. He’s an average player in my eyes, not sure how much starting potential he has. He’s got a draftable grade from me, but didn’t impress me too much today. Philip Blake (Baylor) impressed me today though. He showed a strong anchor and looked pretty good at guard and at center today. I will definitely be keeping an eye on him the rest of the week. Cordy Glenn (Georgia) was a very pleasant surprise as I didn’t expect a great week from him. He didn’t show much bend in his waist and had an impressive ability to anchor and sustain. He’s an impressive player that might be able to stick outside at tackle or succeed inside at guard. He’s definitely above Kelechi Osemele on my board right now. Troy Brown (Troy) didn’t impress me much today though. He didn’t look very good at tackle, and I think he might have to shift inside at the next level. He’s a solid player, but I’m not sold on him at tackle. Quentin Coples (North Carolina) was the biggest winner out of anyone I watched today. The guy absolutely has top 5 talent, it’s just a question of how much he wants it. He will be as good as he wants to be, so it’s a question of desire and work ethic for judging him. Hopefully I’ll be able to get a sense of that throughout the week. He is just so athletic for his size that he had me drooling at his potential as a strong side end in a 4-3. He’s not an ideal right end in my opinion but as a left end he could be one of the best in the league if he wants it bad enough. I just hope he lands somewhere with a great defensive line coach that can light a fire under him. He’s got some red flags around him, but his upside is as intriguing as any defensive player in this entire draft in my opinion. Melvin Ingram (South Carolina) and Courtney Upshaw (Alabama) continued to impress me today. Ingram looked very fluid in pass rush drills, showed an impressive variety of pass rush moves and consistently won 1 on 1 battles in the pit. I think he is fluid enough to be a 3-4 OLB and I think he has enough strength and power to play 4-3 DE. He’s a versatile player that will likely earn a 1st round grade from me once I’m able to watch him more on tape. Upshaw is such a physically impressive player. He’s not a freak from a measurables standpoint but you can tell he’s going to be a quality player in the NFL from watching him. He’s so strong and physical that I would never bet against him. His lack of length might limit his upside a bit, but there’s no question he can be a starting outside linebacker in a 3-4 or maybe even a 4-3 left end. I just haven’t watched him enough yet, but I like his game. My two favorite defensive tackles on this roster were Brandon Thompson (Clemson) and Jaye Howard (Florida). Thompson has solid measurables and packed 311 pounds onto his 6’2” frame but his burst and quickness is my favorite part about his game. He gets off the ball very quickly and overwhelmed some of the interior linemen on the South today. He was consistently disruptive all practice and looks like a quality 3-tech in the NFL, perhaps a similar player to Jonathan Babineaux on the Atlanta Falcons. Howard is a guy I’ve liked since I watched him play over the course of his junior season and I was happy to get to see him live today. He’s lighter than I would have liked right now, but he beat Cordy Glenn a couple times in 1 on 1 drills. He’s got some burst and athleticism, but I’d like to see him get stronger and get up above 300 pounds for sure. Kheeston Randall (Texas) continued to disappoint today. He got pancaked by Ben Jones, a player I am not high on, and struggled consistently against everyone he went up against. He won a couple of battles, but his stock has been slipping all season and nothing I saw today will change that. He looks like a guy who will go in the 4th round range to me. He’s got the size you’d love in a defensive tackle but he has limited length and he weighed in at under 300 pounds. He’s got potential, but he hasn’t lived up to it at all. Tydreke Powell (North Carolina) and Tony Jerod-Eddie (Texas A&M) both showed some ability as bull-rushers in 1 on 1 drills when they were able to push their man off the ball, but neither showed the ability to shed and they look like 2-down guys in the NFL. Powell plays too high at times and negates his strength, and on film I’ve seen him try to penetrate upfield and make plays in the backfield despite his lack of great burst or quickness. He’s a mid-round guy in my opinion, and I’m not sure he has much upside. Jerod-Eddie is similar but when I’ve seen him he seems like he has a bit better gap responsibility, but I haven’t done enough study on him yet. He seems like he could possibly be a 3-4 defensive end, but if he plays defensive tackle in a 4-3 he would strictly be a run stopper. I think my favorite linebacker in all of Mobile is Keenan Robinson (Texas). He’s got experience playing all three linebacker positions but I think his best position is probably the weak-side. He’s a helluva hitter, a very good tackler and he has ability in coverage. He’s a complete linebacker and he’s going to be a riser after this week. Keep an eye on him at practice, he will impress you. One player who surprised me a bit was Zach Brown (North Carolina). I shouldn’t be so surprised he looked good in practice because that is when he should theoretically look best since there is no tackling allowed and that is something he struggles to do. But he took better angles than I saw on tape and clearly has all the athleticism you could want in coverage. Sean Spence (Miami) was disruptive today and when you watch him you can’t help but imagine how good he would be if he was bigger. His weigh-in likely hurt his stock, but in the right system (perhaps a Cover-2 or heavy zone system) he could be an impact linebacker. Nigel Bradham (Florida State) is another player I like. He’s just a solid, fundamentally sound guy that I think has a NFL future as a starter. I’ve liked him since his junior year, so I am excited to take a closer look at him the rest of the week when I have the chance. I was focusing on the offensive line and the defensive line today, but my colleague at NFL Draft Monsters Brandon Howard was keeping an eye on the skill position players today. Give him a follow on Twitter @DashDiallo1 and follow this link to see the rest of our coverage of the South practice! Thanks for reading! Vinny Curry, DE, Marshall: Curry is a very talented player but when I watched him I just didn’t see 1st round ability from him. He’s been very productive at Marshall and deserves to be at the Senior Bowl, I just don’t know that I buy him as a 1st round pick based on the film I’ve seen of him. I will be very interested to see how he does against this significant jump in competition. Mike Martin, DT, Michigan: Martin is an all effort/all hustle defensive tackle that I like despite his lack of size. He’s going to be a rotational guy from day one in the NFL in my opinion and while he won’t wow people at the weigh-in I think he is going to make an impact at the next level. Shea McClellin, DE, Boise State: I’m glad McClellin got an invite here because I like him as a defensive end. I don’t think he’s a 1st rounder but he’s definitely in the 2nd/3rd round range on my board right now and I haven’t done much film study on him yet. He’s got some edge speed and if he filled out his frame a little bit I think he could be a 4-3 left end and apply a pass rush from the position which is much harder to find that many realize. He can definitely help himself this week, so I’m looking forward to watching him. Alameda Ta’amu, DT, Washington: Ta’amu had a TON of hype going into the bowl game against Baylor and then Baylor ran right up the middle all game and people started to hop off the bandwagon. Ta’amu didn’t impress me in that game at all obviously, but he didn’t get to be a legitimate NFL prospect because he played like that all season. He will make himself a lot of money this week if he shows he can stand up to double teams and that he has some burst off the line of scrimmage. But he will continue to drop if he gets washed out versus the run and shows no push as a pass rusher. Billy Winn, DT, Boise State: Winn is a guy I have been high on since last year, he’s got impressive size and length based on the film I’ve seen of him and I really like his upside as a 4-3 DT or as a 3-4 defensive end. He’s got versatility and I think he’s going to end up going in the first two rounds, especially since this defensive tackle class isn’t exactly stacked. Derek Wolfe, DT, Cincinnati: Wolfe is an underrated player that doesn’t have huge upside but I think he has starting potential in the NFL. Brandon Holstein (@NFLDraftRoundUp on Twitter, follow him) pointed him out to me the first time months ago this season and when I got a chance to watch him I liked what I saw. Again, he’s not a stud defensive tackle but he is definitely draftable in the 3rd/4th round range in my opinion and I look forward to seeing what he can do this week. Andre Branch, DE, Clemson: Andre Branch was a player that I did not like at ALL when I watched him as a junior last season with Bowers opposite him, so I did not have high expectations for him as a senior at all. Most of his pressure on the quarterback came as a result of one on one’s and he didn’t show that he could use his hands at all and accomplished all his production thanks to his athleticism. But this year he flashed hand usage and the ability to use pass rush moves when I watched him. He has a TON to prove this week because if he has a good week he could be one of the biggest winners of the Senior Bowl thanks to his prototypical defensive end size and athleticism. Keep an eye out for Branch because he could make himself a ton of money this week. Quinton Coples, DE, North Carolina: Coples came into the season projected to be a top 5 pick and his stock has slowly slid ever since then. He didn’t live up to expectations as a defensive end this year and plenty of people are projecting him inside to defensive tackle. I have no doubt that he could bulk up to play defensive tackle, but I haven’t given up hope on him as a left end. I think people really underestimate how difficult it is to find a left defensive end that can play the run and rush the passer at a high level. 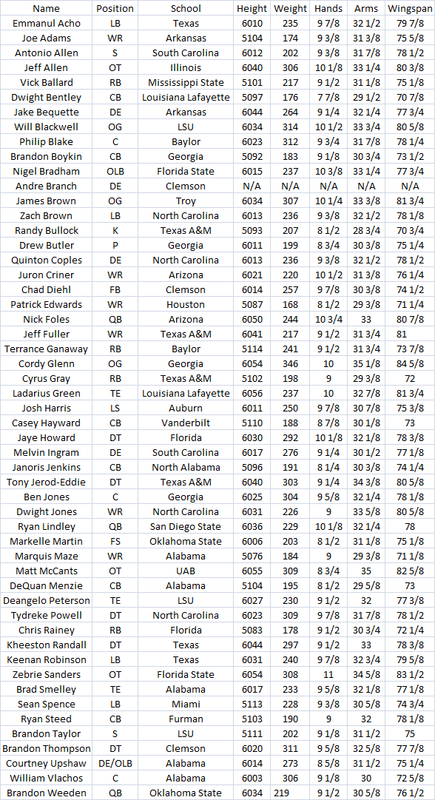 Coples has that potential and I think that is what will keep him from sliding out of the top 20 or 25 ultimately. He has a lot to prove this week as well, and as a Tar Heel fan I will certainly be rooting for him. Jaye Howard, DT, Florida: I am really happy that Howard is here. I remember watching him as a junior and thinking that he definitely had draftable ability and I believe he was on my list of potential break-out players this year. He definitely deserves to be here and he could open some eyes this week. He’s not the flashiest guy but he is reliable and should make some plays in the backfield this week. Melvin Ingram, DE, South Carolina: Ingram has a chance to make himself a lot of money this week as well. He’s got quality size for a defensive end and has really improved his stock over the course of the season when everyone (including me) thought Devin Taylor and Jadeveon Clowney would be the talk of the defensive end position. I’m excited to see him live this week. Tydreke Powell, DT, North Carolina: Powell is a player that I personally think is very overrated. He’s got a late round grade from me at this point and having seen a significant amount of film on him I’m not sure there’s a lot he can do this week to change my mind. His upside in the NFL is a 4-3 NT but he doesn’t offer much as a pass rusher and he doesn’t defend the run well either. His best bet is to land in a scheme that asks all of their defensive linemen to penetrate and make plays in the backfield, but he isn’t the athlete to consistently do that (it’s just what he likes to do, based on film). Powell could get exposed this week if he doesn’t play with better gap responsibility, and I have no reason to think he will based on the film I’ve watched. Courtney Upshaw, DE/OLB, Alabama: I’m very glad Upshaw is here and I’m sure a lot of other people are as well. He will likely be playing out of position at 4-3 DE all week, but he has enough ability to play with his hand down and succeed even if his best position is 3-4 OLB in my eyes. I’m excited to see him in person because he really impressed me when I watched him this year, especially in the National Championship. Honestly, I’m not wowed with the linebackers here. Zach Brown (North Carolina) is the odds on favorite to be the first one drafted, but I’m not high on him and he looks like a better athlete than a linebacker when I watch him. He won’t be able to show his tackling ability this week so he could really impress people thanks to his athleticism and potential but he struggles with wrapping up and making quality tackles. One guy I do like is Nigel Bradham (Florida State). He’s not an elite prospect but I think he will be a NFL starter in a 4-3 defense. Another guy I am very high on is Keenean Robinson from Texas. He’s got great instincts and may be my odds on favorite to boost his stock as much as any other linebacker in Mobile this week. Look out for him, he is an absolute player. This defensive back group took a hit when Mark Barron (Alabama) announced that he would not be here this week, but it makes sense that he elected to skip it because his stock can really only go down at this point. I’m very excited to see Casey Hayward (Vanderbilt) who I have been talking up for well over a year at corner, Janoris Jenkins (North Alabama, formerly of Florida), Alfonzo Dennard (Nebraska), Jamell Fleming (Oklahoma) and Leonard Johnson (Iowa State). Jenkins was a corner I was very high on when he was at Florida, so it will be fun to see him in person despite the troubles he has this past year. Jamell Fleming and Hayward were both on my potential break-out players list that I posted before the season this year, so I am very excited to see both of them live. I really like both of them in coverage even though they may not have prototypical size (Hayward may be 5’9” or 5’10”) and speed. They’re good cover corners and that should show this week. Here is a post where I make some picks for the games the top 25 teams are playing for the week. I’ll try to do this every week, but I might not always have time. I’ll track them to see how well (or poorly) I do over the course of the season. Enjoy! Analysis: Oklahoma’s offense and defense are both very good, and Missouri didn’t prove they could win against Arizona State, losing 37-30 in OT. James Franklin will probably struggle to carve up the Oklahoma defense like he did the ASU secondary, and I wonder just how much pressure their defense will be able to apply to Landry Jones. Jones will make poor throws when he has pressure in his face, so that will be the key to hanging in on this game. The problem is, I don’t think Missouri’s secondary can hold up consistently if the Tigers are forced to blitz to create pressure. Analysis: LSU’s defense is the best in the country as far as I’m concerned. They were tested right off the bat against Oregon and stood very tall. I’ve never seen a defensive tackle rotation like theirs in all my years of watching football. I believe that they have four starting caliber defensive tackles, and they arguably have three starting caliber cornerbacks in Morris Claiborne, Tyrann Mathieu and Tharold Simon. Claiborne is a junior and Mathieu and Simon are both sophomores, but they might be the best trio of cornerbacks in the country. LSU’s run defense and pass defense are both very good and their defense is very fast, and I think they are going to cause a lot of problems for Geno Smith and his offensive counterparts. On defense, West Virginia will have to pressure Jarrett Lee, but also stop LSU from establishing the running game because they love to run play action after establishing the run (and they’re quite good at it). Without the play action fake LSU struggles to threaten downfield due to Lee’s lack of arm strength. However, I think WVU will struggle to take away the run game, end up loading the box, and therefore allowing Rueben Randle, Odell Beckham and Deagnelo Peterson to get behind the secondary. This one was tough for me to call. Alabama probably has the #2 defense in the country behind LSU (at least as far as I’m concerned, but it’s definitely close) and they have a quarterback with limited experience as well in AJ McCarron. Luckily, they have two talented running backs to take the pressure off of him in Trent Richardson and Eddie Lacy. Marquis Maze has stepped up as I thought he would and has 15 receptions, 186 yards and 1 TD in the first three contests. I think Alabama will be able to move the ball on offense against Arkansas’ defense, but I think that Alabama will be able to slow down the Razorbacks offensive attack. I love their WR’s, led by Cobi Hamilton as of now (13 receptions, a team leading 252 yards, 19.4 average per catch and 1 TD) and Tyler Wilson has stepped in to fill the void left by Ryan Mallett like I thought he would. However, Alabama’s defense is vastly better than Missouri State, New Mexico, Troy (the three teams he has faced this year) and much better than Auburn’s defense that struggled mightily to stop big, physically gifted receivers every time they matched up against them. Arkansas won’t get shut out by any means, but Alabama is going to be Tyler Wilson’s first real taste of what it’s like to play against a SEC caliber defense, and I don’t think he’s going to enjoy it. This really isn’t a hard pick in my opinion. Boise State’s defensive line is fierce and I expect Billy Winn and company to be in GJ Kinne’s face for the majority of this game. Boise State’s offense is still clicking thanks to Kellen Moore, so I expect this to be a relatively easy win. Kinne has a chance to show talent evaluators what he can do though, as his team is clearly overmatched. This shouldn’t be much of a contest either, as Wisconsin’s offense has the potential to be one of the best in the Big 10 if it isn’t already the best. Their running game and play action game will be way too much for South Dakota to handle, and hopefully they have continued to work on their run defense. If they don’t have it tuned up soon they will have a lot of trouble stopping Nebraska. This one was very tough for me to call as well. This could very easily go either way considering it is a rare battle between the #7 and #8 teams in the country. Oklahoma State’s offense is a juggernaut still led by Brandon Weeden and Justin Blackmon, but Weeden has thrown 6 interceptions already this season, so that is a concerning stat for OSU fans. However, Joseph Randle has stepped up to replace Kendall Hunter very nicely, running for 378 yards and 7 TD’s on only 62 carries (6.1 average). Ryan Tannehill is a dangerous quarterback though, and he’s got a number of weapons to work with. I’m not sure which defense is better than the other, but I do think that Texas A&M will miss Von Miller rushing the passer in this game. However, Oklahoma State’s defense is traditionally their weakness, so that is why I had to go with Texas A&M. I will be at an away game during this contest and I am very angry that I will miss it. It should be a great game. But I had to give A&M the slight edge. Not a very tough call on this one. Nebraska should win this game easily even if Taylor Martinez doesn’t dazzle as a passer. This one wasn’t as easy for me to pick as I thought it might be. Oregon has a pretty good defense, but Arizona can move the football pretty well. I’m still confident in Oregon, but Nick Foles has a habit of surprising people when they sleep on him. I don’t think Oregon will take him for granted though especially after losing a tough one to LSU in Cowboys Stadium, and that’s why I think they will end up with a big Pac-12 win here. Clemson is absolutely on fire right now, and this is the worst time for Florida State to be playing them. This isn’t a guarantee by any means, but Clemson’s offense is firing on all cylinders and Florida State didn’t get consistent pressure on Landry Jones last week. Clemson’s offensive line isn’t nearly the equivalent of Oklahoma’s, but they have enough weapons on offense to at least make this a plausible upset. I don’t think Clemson has the defense to keep them in the game if they can’t score, so unless their defense steps up and slows FSU down they are going to make me look foolish for this pick. This isn’t as easy of a pick as I thought it would be, especially since South Carolina is in a state of flux and Vanderbilt is undefeated for the first time in recent memory after three weeks. I don’t think Vanderbilt will be able to hold off South Carolina, but stranger things have happened. If it was ever going to happen, I think it would happen now. Steve Spurrier doesn’t seem to have much faith in Stephen Garcia and even though they have one of the best backs in the country in Marcus Lattimore you just never know what will happen in the SEC. I don’t expect Vanderbilt to pull it off, but this is one I would watch as a POSSIBLE upset. Analysis: This shouldn’t be much of a challenge for Virginia Tech, but it should be a good tune-up game for Logan Thomas. I think he has tons of upside, and it’ll be interesting to see how he develops throughout the season. Analysis: Kentucky isn’t a terrible team, but Florida’s defense is vastly better than I expected it to be even without Janoris Jenkins. Chris Rainey really impressed me last week and if he can stay healthy I think he could really improve his draft stock. I’m pretty high on Jonathan Bostic, Jaye Howard and Dominique Easley on their defense, so I’m excited to see them play against Kentucky again. I don’t anticipate the Gators having a lot of trouble in this game. Analysis: Robert Griffin has been absolutely LETHAL this year. He’s 41/49 for 624 yards (83.7% completion), 12.74 yards per attempts and he has 8 touchdowns and no interceptions. On top of that, he has 116 yards rushing. Kendall Wright has been huge for Baylor with 20 receptions (14 more than the next receiver), 312 yards (184 yards more than the next receiver) and 3 TD’s. I don’t think Rice has much of a chance to slow Griffin down. The first time he might slow down in my estimation would be October 15th against A&M once they get into the real meat of their schedule. I haven’t been able to watch much of him, but it will be interesting to go back and watch him play to see if he has corrected any of the things I said he needed to work on in my preseason scouting report. Analysis: South Florida is having one of their best seasons in recent memory, at least to start the season, and BJ Daniels seems to be maturing rather nicely. As long as he continues to develop the sky is the limit for USF, and I don’t think UTEP will have much of a chance to slow them down this week. Analysis: TCU lost a tough one against Baylor in week one, but they seemed to have bounced back in recent weeks. Portland State shouldn’t pose much of a threat, even with an inexperienced quarterback still getting a feel for the starting role. Analysis: Brady Hoke welcomes his former team into the Big House as the Head Coach of the Wolverines this week as pretty heavy favorites. Denard Robinson isn’t my favorite quarterback but he is incredibly fast and I’m not sure SDSU has the speed to keep up with him in this game. Junior Hemingway has really stepped up this year (even though he looks like a TE rumbling downfield sometimes on go routes). It’ll be interesting to see how Michigan does in this game, but I would be pretty surprised if they botched this game after clawing their way into the top 25. Analysis: Before the game against Illinois last week I might have picked Arizona State in this one, but Brock Osweiler is still developing and even though the Sun Devils had a huge win against Missouri a couple weeks ago I don’t think they are ready to knock off USC. USC has a big chip on its shoulder because of the bowl ban that was placed on them, and I think they will approach this game with something to prove even though they are favored. Analysis: This shouldn’t be a challenging game for Illinois. Western Michigan isn’t a bad program, but I don’t think they have the firepower to stick with Illinois on either side of the ball. They just fought their way into the top 25, so I don’t think they’ll get upset after just earning their #24 ranking. Analysis: I have to admit that I am a UNC fan, so that may have had something to do with this pick (which really isn’t much of an upset, though technically it is). I think UNC’s offense can score on Georgia Tech’s defense, and I think UNC’s defense is fast enough and disciplined enough to slow down Georgia Tech’s option offense that absolutely dominated Kansas last week. Georgia Tech is flying high, but UNC usually plays them pretty well and they are talented enough to pull this off. I really wish I could see this game, but I will be traveling and working while it goes on. Those are my picks for this week. Hopefully you enjoy them and I look forward to seeing some good football this week. Thanks for reading! Analysis: Randall is a huge guy at 6’5″, 295 pounds and I think he will be very disruptive during his senior year at Texas. Texas has been churning out some quality defensive line prospects in recent years, and I don’t think Randall will be an exception to that. Last year as a junior he produced 33 tackles (22 solo), 10.0 TFL, 1.0 sack, 2 pass deflections and he blocked two kicks/punts. I am excited to watch him play this year and I think he has a lot of NFL potential. Analysis: Powell is another talented North Carolina defensive lineman that has the potential to help make North Carolina’s defense very dangerous if they can avoid the problems that last year’s talented defenders ran into. Powell is a very large man at 6’3″, 310 pounds and should be a very effective nose tackle for the Tar Heels this season. Last year as a junior he managed 47 total tackles (25 solo), 3.0 TFL, 2.5 sacks, 1 FF and 1 pass deflection. He may not rack up a lot of stats this year, but his impact will be felt if North Carolina can stuff the run, especially up the middle. I look forward to seeing if he can stuff the run but also collapse the pocket as a pass rusher this season. Analysis: Crick is a very tall guy at 6’6″, 285 pounds and may be an ideal 3-4 DE candidate in the NFL. However, for now I have him ranked as a DT until I can further evaluate his potential as a 3-4 DE, but I thought I’d make sure everyone knew that the potential was there. Last year he had a very good season even without Ndamukong Suh when he amassed 70 total tackles (36 solo), 14.5 TFL, 9.5 sacks, 1 FF and 1 pass deflection. He is the man on the Nebraska defensive line now and he will have a talented player next to him much like Suh did as a senior as Baker Steinkuhler looks to emerge as a junior. It will be interesting to see how this tandem fairs in the Big-10 and if they can disrupt offenses anywhere nearly as effectively as Suh and Crick did two years ago. Analysis: Ta’amu is a huge man weighing in at 6’3″, 330 pounds. He is an ideal nose tackle and I think he will get a lot of interest from 3-4 teams for that reason. I haven’t seen him play much so I don’t know his tendencies yet, but I know he has the ability and potential to completely plug up the interior of the field thanks to his sheer size. Last year as a junior he produced 39 tackles (21 solo), 5.0 TFL, 1.5 sacks and one pass break-up. Like Powell, Ta’amu’s true impact won’t be measured on the stat sheet but on the outcome of the game. If he plays effectively the opposing team’s running game should be significantly hindered, especially up the middle. I am excited to see if he lives up to the billing that I am giving him in my pre-season rankings this year. Analysis: Forston is another player that I outlined as a potential break-out star in my break-out post from a few weeks ago. He has a lot of potential and will be playing on an incredibly talented Miami defense as a whole, but the defensive line is going to be the strength of their team. Adewale Ojomo, Olivier Vernon and Forston should form a very dominant starting line-up, plus they have a lot of depth to keep the pressure on opposing offenses. Forston should have a lot of success this season, but last season he still managed 37 total tackles (16 solo), 12.0 TFL, 3.0 sacks and one interception. I expect him to improve on all of those statistics this season, as I expect that he could very well get 50+ tackles, 12+ TFL’s and 6+ sacks as a junior. He has a ton of ability and on that talented defensive front he should have every opportunity to show it. Analysis: Winn is a guy that I think could have either been a break-out player or a sleeper but I didn’t know how well known he was. He has great size at 6’4″, 288 pounds which might also make him a candidate for the 3-4 DE position down the road. He was quite disruptive as a junior even though I believe he was in a rotation at the time. He produced 29 total tackles (12 solo), 10.5 TFL, 5.5 sacks, 2 FF’s and 1 pass deflection. I expect him to improve on all of these totals as a senior and I think he could surprise a lot of people. He definitely stuck out when I watched Boise State last year, and I have had my eye on him ever since. I expect him to really emerge this year. Analysis: Reyes had something of a coming out party last year as a junior. He has impressive size at 6’4″, 298 pounds and was quite productive last season. He managed 39 total tackles (26 solo), 10.0 TFL, 2.5 sacks, 2 INT’s, 1 FF and 4 pass deflections. I was particularly surprised that he had not only made one interception last year, he had made two and had a combined total of 81 return yards from both of them. That demonstrates some level of athleticism, and while I haven’t specifically watched him I have to say I am intrigued and interested in watching him this year. Analysis: Worthy has impressive size and while he is only a junior he was still productive as a sophomore. He produced 40 total tackles (14 solo), 8.0 TFL, 4.0 sacks and 3 pass break-ups. He also has pretty impressive size at 6’3″, 305 pounds. I haven’t seen him play much yet, but I will definitely be watching a lot of Michigan State this year to evaluate Kirk Cousins among others. Worthy will definitely be one of the players I take a look at. Analysis: Chapman is a stocky nose tackle for Alabama and while I haven’t seen him play much yet I am anxious to see how he holds up if he is indeed their 3-4 NT. He is 6’1″ but still weighs 310 pounds, making him a sound fit at the position if he is strong enough to stand up to double teams. Last year as a junior he managed 31 total tackles (18 solo), 3.5 TFL, 1.0 sack and 2 pass break-ups. It will be interesting to see how he does without some of the talent that Alabama lost to the draft, especially Marcell Dareus. Analysis: Howard may not be that well known, but I am pretty high on him. He was very disruptive last year for Florida, and he has pretty good size for the DT position. He is 6’3″, 302 pounds, and as a junior he produced 28 total tackles (19 solo), 10.0 TFL and 2.5 sacks. He is very active in the backfield against the run, but I haven’t seen him enough to evaluate just how dominant he is against the run and I haven’t evaluated him much against the pass yet either. I had to put him in my top ten though because I really think he has that kind of ability. Hopefully you enjoyed my early defensive tackle rankings! I really think this defensive line class has the potential to rival that of this past year’s class, as highly touted as that was. Thanks for reading!